This picture is what summer time is all about. Fun times with friends. 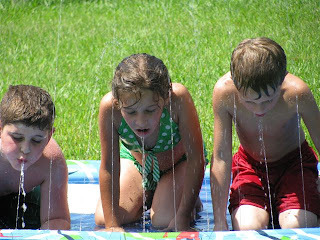 Nothing like a drink from the slip-n-slide to quench your thirst. Great Picture! I found your comment on Lisa's blog. I am The Charm House that had the Giveaway that Lisa won! I noticed that you visited my blog but did not sign up to take a chance to win. I hope in the future you will continue to visit and next time you will take a chance a sign up! I love your profile. My son will be graduating in December from Liberty University and will start teaching highschool. It is so awesome that your husband is a teacher! God Bless you and your family! That is the greatest summer picture ever. This will forever be one of my all time favorite pictures! What a wonderful carefree time for all of them. I wish we could keep them this age!